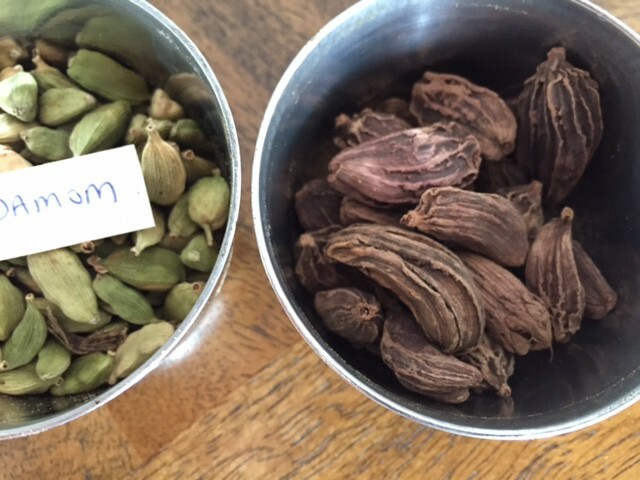 Black cardamom pods mainly come from India and Nepal where they’re dried over open flames. This produces their distinct smokey taste. I’ve seen it described as a ‘camp-fire’ like flavour. Since getting my hands on a small bag last year I’ve really only added them to Mexican based stews. Like my black cardamom beef. But this week I’ve found a new use for them – in this creamy curry. I’m sharing the recipe here as part of Fiesta Friday. Fiesta Friday is a weekly gathering of wonderful cuisines from all over the world – it’s a welcoming foodie community; a place to share personal recipes and to be inspired by those from others. I’m very excited this week to be co-hosting alongside Su from Su’s Healthy Living. We’d love you to join in by linking your posts to Fiesta Friday and to the blogs of this week’s co-hosts (Feast Wisely and Su’s Healthy Kitchen). And don’t forget to tag ‘Fiesta Friday’. (You can check out the guidelines here). Back to this recipe. Finally a new creative use for those little black cardamom pods. I love this vegetarian and vegan curry for its superfood properties. It contain a generous dose of turmeric, ginger and garlic and is packed with powerful antioxidants thanks to the ‘anthocyanins’ in the eggplant (or aubergine). Anthocyanins have had lots of attention in health circles recently – these amazing phytochemicals give purple fruits and vegetables their vibrant colour and they play a role in protecting against cell damage. Since hearing about them I’m super conscious about getting purple fixes – not just from eggplants but also from beetroot, purple carrots and red cabbage. I found this recipe at The Bojon Gourmet, in a post from Alanna who talked about her love of eggplants. I made a few adaptations, like using full sized eggplants instead of finger ones, adding some peas and blending the onion, garlic & ginger into a paste. But overall I followed Alanna’s recipe. And I have to agree with her that this is one of those curries that tastes even better the next day……. Chop each eggplant into bite size chunks. Lay the chunks on a baking tray and sprinkle them with salt. Leave for 30 minutes or so for the salt to draw out the moisture. This works to remove any bitterness. Then rinse, drain and dry the eggplant before adding it to a pre-heated oven for 20 minutes to roast. Roughly chop the onion, ginger and garlic and puree into a paste in a hand blender. Heat the oil or ghee in a large saucepan on a medium heat. Add the paste and cook for 5-10 minutes. Crack open the black cardamom pods and add the seeds and pod shells to the pan alongside the chilli. Crack open the green cardamom pods and add the seeds to a pestle and mortar with the coriander seeds and peppercorns. Ground to a fine spice powder. Add the spice powder and turmeric to the pan and cook for 1-2 minutes until aromatic. Then add the coconut milk, tomatoes and water. Bring to a simmer. Return the roasted eggplant to the pan and simmer for 20-30 minutes to reduce the sauce. If you have time (like I did) simmer the base sauce for an extra 30-60 minutes before adding the eggplant and finishing with step 10. Consider throwing in other vegetables as well – I included peas and roasted sweet potatoes. Don’t forgot about the black cardamom shells. Remove them as you serve if possible they don’t taste so good whole. Tags: aubergine, coconut, curry, eggplant, Fiesta Friday, vegan, vegetarian. Bookmark the permalink. Curry dishes make me happy! It is such a great spice. This looks yummy! Thanks Petra – yes and eggplant is so versatile too – I’m trying to experiment more and more with it given all of the purple antioxidant goodness it contains! Laura, I see that you love Indian food!! What a coincidence that not only did we both bring Indian curries to Fiesta Friday, we both brought coconut-based curries! I was right that we think alike! Love your aubergine curry. I am definitely going to try your version.If you want it to be vegan, use coconut oil and not ghee as ghee is nothing but clarified butter. Now, lets go and mingle with our guests! The curry looks scrumptious! I am so happy that I am following your blog! Thanks so much Sandhya and yes eggplant really is a super vegetable thanks to its purple colour. Thanks for following too! This looks amazing! 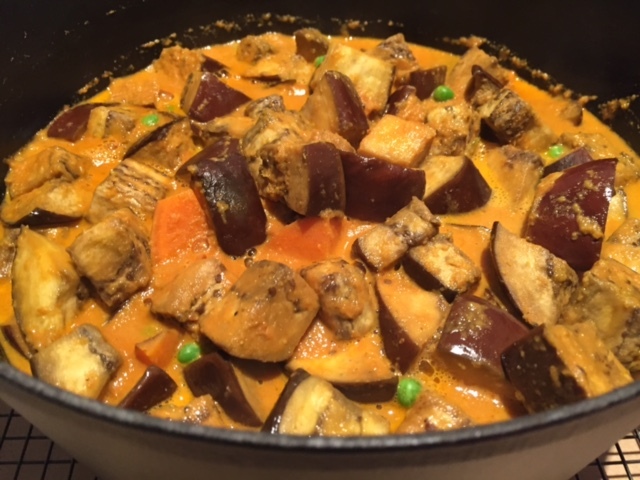 I love eggplant… and curry! Thanks Marisa – in that case this curry is for you, hopefully you like coconut as well! Thanks so much – and yes the black pods are much larger than green ones and they pack a real flavour hit for stews and curries! Gosh this looks great! Perfect for this time of the year – I love winter and hearty vegetarian food like this. Hurrah for eggplants! Thanks Hungry Mum and yes I’ve been loving using the imperfect picks eggplants from Harris Farm Markets – such a bargain….. This looks so top notch! Always looking for new eggplant recipes!! What a beautiful dish. It sounds absolutely delicious. Thank you for co-hosting FF! Thanks so much Julie and thank you for joining Fiesta Friday! This sounds so tasty! I shouldn’t look at your delicious recipes when I’m hungry! I love dishes using those black cardamom pods. This looks delicious. And, thank you so much for voting for me on Fiesta Friday as a co-host. No problem Liz and yes those little black pods always add an extra wow factor to stew or curry based dishes – now I just need to find somewhere I can buy them!